I was having a bit of a discussion with my editor, Matrice, who is working on my book, A Sterkarm Tryst. She wanted to know what season of the year the book was set in, because my descriptions confused her. Sometimes she thought it sounded early in the year, and sometimes it sounded late. It's set in late summer, or early autumn, I said. Crops are almost ready for harvest but not quite yet. Some leaves are starting to turn, but there are still late flowers. Some berries are ripe, many still unripe. This season was always a good time to fit in a bit of swift aggro. The fiercely cold winters of the 16th Century, with their deep snow, hadn't set in yet, and if you acted quickly, you could clobber your opponents during 'the hungry gap.' And perhaps be a little less hungry yourself. The Hungry Gap fell around July or August and reminds us how seasonal life was in the past, and how much we've lost touch with that seasonality. The harvest was gathered in roughly around the end of August and into September. Hay was made and grain was cut, threshed, stored. Fruit, nuts and mushrooms were gathered and stored. Throughout the summer, cows had been milked and the milk turned into butter and cheese for storing. Eggs were preserved. It was expensive to keep animals alive through the winter, sheltering and feeding them. So most unwanted animals were sold earlier in the year, when they were young and, of the rest, only the best were kept alive. The rest were slaughtered around mid-October, and the meat smoked, salted or dried. All the hard work was celebrated with a party - and most other big parties, such as weddings, were also held at this time of the year, because there was plenty of fresh food. You had a blow-out at Christmas, of course, to help everybody get through that cold, dark part of the year. Bitterly cold, because this was the period when the Thames froze solid, so imagine what the weather was like further north. And very, very dark without any light except fire and candlelight - and every candle had taken time and effort to make, every piece of fuel had been gathered, dried and stored. Whatever food you had in store had to be carefully tended to get you through the rest of the year until the next harvest. The dog outside the door. And give you ten times more! 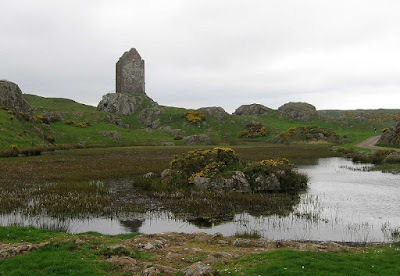 Households like the Bedesdale Tower in the Sterkarm books wouldn't have been small. 'Family' at the time was often understood to include servants as well as blood relatives, and the family living at the tower would have included men at arms, many maids, cattle men, kennel men, stable boys and so on. Most of them would have expected to be fed from the tower's stores as part of their wages. That's why the tower's yard is crowded with storehouses, the upper storeys of which serve as dormitories. Every large farmhouse would have needed to feed a crowd every day, too. Imagine being the women who had to oversee those stores and manage them. That's why, from the Viking Age onwards, the sign of a woman in charge of a household was a large bunch of keys hanging at her waist - to keep those stores locked up! The stores dwindled day by day with every meal served. That Christmas feast had to be planned. As the year turned into spring, the level of grain in the bins dropped. The cheeses and blocks of butter were eaten up. The barrels of salted meat and fish were emptied. The flitches of bacon were carved up. By the time July was reached, there were far more empty barrels than full and people were heartily sick of dried, salted and smoked food - but nothing in the fields or hedges or woods was yet ripe. People ate the first hawthorn leaves, calling them 'bread and cheese.' The harvest of fresh food must have been looked forward to so keenly. Today, when we can nip out to the supermarket and buy fresh food regardless of the time of year, and keep bags of frozen (and almost fresh) food in our home-freezers, we have forgotten 'the hungry gap.' Imagine standing in a summer field - wheat or oats tall and waving, hedgerows thick with flowers and leaves, little garden brimming with greenery - and nothing ready to eat. If the weather was poor and held back the harvest, then the wait was longer - and the food in store still went on dwindling, day by day. The gap in those years was wider and hungrier. If you struck at your enemy at this time of year, burned and trampled the crops standing in their fields - burned or stole what they had left in store - burned their houses - then you ensured that they had a miserable, hungry winter ahead of them. Matrice was not altogether convinced by my talk of the hungry gap - she's a good editor and it's her job to question. She said that her Irish ancestors didn't have a hungry gap because they planted relays of potatoes and other vegetables from early in the year, to take them through summer. Yes, but the Sterkarms would never have seen a potato or heard of one. The historical parts of the books are set, roughly, about 1520. This is something like 200 years before potatos became a staple crop in Ireland and the Scottish Highlands. And although improvements in technology and agriculture were being made, the developments that really changed things came later. The north country reivers didn't go in much for arable farming - they were, as their ancestors had been for centuries, practicers of 'transhumance.' That is, they were cattle-farmers who moved their animals between sheltered lowland pastures and higher meadows for summer grazing. They grew oats for grain, because it was the only cereal that grew at all well so far north, and such fruit and vegetables as they had would have been much closer to the wild variety - or actually were the wild variety, gathered from woods, moors and hedgerows. Some of my Scottish friends have doubted this since, for them, the 'Kingdom of Fife' is 'the UK's bread-basket' with its wide and beautiful fields of wheat. But Fife only became so productive of wheat after the agricultural revolution of the mid to late 1700s, when more intensive and scientific methods of farming were introduced, together with the development of hardier and/or more productive strains of wheat. summer, and some that ripen in the autumn - but these are varieties that have been bred by intensive modern agriculture. The Sterkarms' strawberries would have been wild ones. They flower, fruit - and that's your lot until next year. 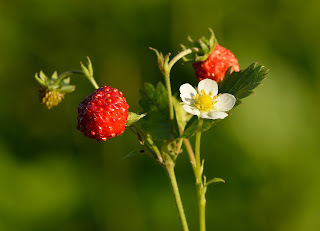 Wild strawberries are doing it for themselves, not for us. 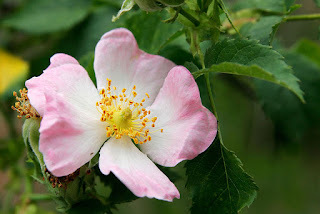 It reminds me of my beautiful dog-rose, which has a brief burst of flowers every year. They last about three weeks and then - no matter how much I dead-head - they're gone. Everything about life in the past must have had the same aching transience - Come and kiss me, Sweet and Twenty, Youth's a thing will not endure! Their warm, light summers were brief and followed by a long, dark and grindingly cold winter, in dwellings which were hard to keep warm. How they must have longed, even more than us, for spring and summer, and how they must have tried to enjoy every warm day - every snowdrop, every violet, every hedge rose. For the Sterkarms, after the relief and joy of harvest, would have come October, November, December, January, February... with the weather becoming more flesh-nippingly cold all the time. Then April, May - things are beginning to leaf and flower, but there's still nothing much you can eat. Then June, July - it's warmer and lighter, but still nothing's ripe - and your stores are running very, very low. August must have been torture! Everything visibly ripening but still not quite there. And this was in a good year. In the modern West, we don't know how lucky we are. Susan Price is the Carnegie-winning author of The Ghost Drum. Her latest book is The Drover's Dogs. 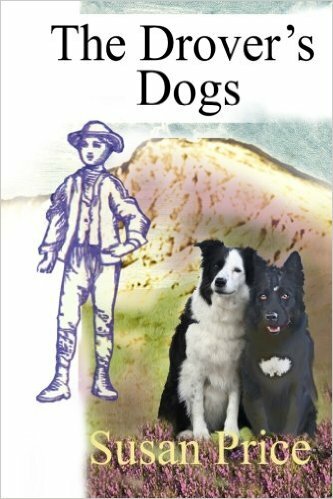 "I don’t think those dogs ever mistook me for their master. They were good herd-dogs and I thinkthey knew exactly what I was — a little calf, lost from the herd. A lost little pup wandering loose. They knew that what they had to do was take me in charge, and herd me along, and watch over me, until they had brought me somewhere safe." across Scotland’s mountains and lochs. God, I love the internet. I've grown up with your books, and here I can read you discussing your 'soon to be out' work. It's so easy to forget how lucky we are with our supermarkets and groceries flown from half-way across the world. Yet our ancestors would have perished in the same sort of winters that we relish as 'proper winters' after a wet and windy summer. That's why we need writers - to remind us of the human side of history. Gosh, thank you, Becca! - I was out walking on the Clent Hills today. The wind was like a knife and yellow leaves whirled all round us. In little patches sheltered from the sun, the grass and leaves were outlined in frost. Yet it's already November and this is a mild winter. It always makes me think of how achingly long, dark and cold winters must have been in the past. Thank you, Sue. So easy to forget the very real effect of the growing seasons and to colour past landscapes with versions of our current plenty. 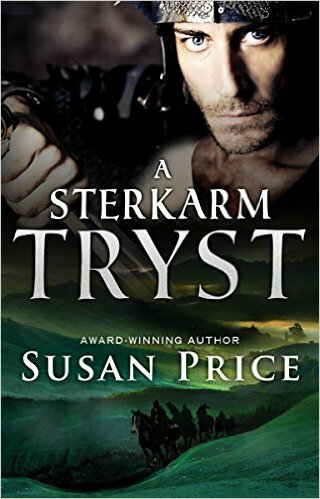 Can't wait for the Sterkarm Tryst!